The adventure of retiring from full-time employment began 145 days ago. Hard to believe it has been that long and yet the time has flown by. I’m not sure where I’ll be in another 145 days, but today I’m on South Padre Beach. During this transition period, and I truly feel like it is a transition, I have had to come to appreciate having my time as my own. Well, most of the time. I have a husband that has also retired and we are traveling across the nation in an RV. I had hoped to do some serious writing but can’t find to update my blog. Oh well. I have published my second book, Coyote Vengeance, since we hit the road and I’m well into editing the next book. There is also an unfinished story that keeps haunting my dreams. We do have a blog to record our traveling adventures, Rambling Toad. So much of my writing time is spent working on that blog with my husband. The days seem busy with things we didn’t have time to do before. Things like taking a tour of the King Ranch, or learning how to be part of hot air balloon crew, or walking in the surf. My writing hasn’t been forgotten and does get attention almost every day, just not as much as I had planned. But then again, I’ve decided retirement is a full-time job. This is the first year in five years I have not completed the NaNoWriMo challenge. Lots of reasons for it, but the biggest reason is I am traveling and couldn’t coordinate everything to find the time to complete the challenge. On December 1, the sun came up and things continued on. I’m not crying or feeling sad for failing to complete my goal. I am glad for the experience and what I learned about myself. The NaNoWriMo group sent me a very encouraging email at the end of the competition. This encouragement is typical of the NaNoWriMo community. What is next? I will continue working on the story with the reality check that traveling takes a lot of my time and energy. After the announcement that Coyote Vengeance, my second book with Texas Ranger Scott Durham, was available for Kindle, I got a question, “Is there going to be a third?” That sounds like a simple question, and the simple answer is yes. However, the book is in my head. Over the past few months this third book has been forming in my head. The characters talk to me sometimes when I’m sleeping and at other times, like when I’m cooking – not good if there is fire or a sharp knife being used at the time. The characters are very demanding of my time. They have outlined a story for me but haven’t given me the complete storyline. One of the characters had the audacity to tell me to get to work before I forget all the good stuff they have been whispering. The getting to work will start next week. This is the story that I will write during the NaNoWriMo. I have participated in four other NaNoWriMo challenges, and have been a winner each time. Winners write at least 50,000 words in thirty days, the month of November. This crazy time fits my writing style, which is take a semblance of a story idea and run with it. For thirty days, I let the characters talk all they want, typing as quickly as I can to keep up with the story. When there are pauses, I push the characters to do something mundane to see what happens. The story writes itself – not ready for publication – but the story is done. This free-flow of ideas to form a story is not always the best way to write. You can end up with some very awkward situations, i.e. a fight scene where your hero punches himself, or two or more descriptions of a character. But like I said, the story completed for NaNoWriMo is not ready for publication. All those silly inconsistencies are part of the editing and rewrite that takes a raw story and makes it ready for the public. To become an author, you first must a have a story. NaNoWriMo is a good vehicle to help encourage you to write the story. So, my challenge to you is sign up for NaNoWriMo, lay in the snacks and caffeinated drinks, and write. Write 50,000 words and you are Winner, even if you never look at the story again. Got to go buy a large quantity of tea (sorry I don’t drink coffee) and an even larger supply of chocolate. Good luck to all of you who will be joining me for the NaNoWriMo Challenge. 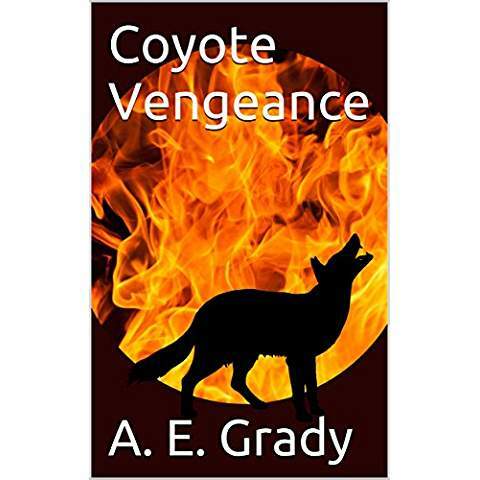 It has been a long time coming but my latest book, Coyote Vengeance, is now available at Amazon. Very excited to have it completed. This is the second story featuring Texas Ranger Scott Durham. He has recently helped to bring down a gunrunner named Frederick Schmidt. While being transported to federal prison, Schmidt escapes from the U.S. Marshals. The Marshals aren’t sure where he is heading, but are concerned that he will make good on his promise to kill Scott. In this story we also have the return of park ranger Amanda Chisholm, who was introduced in the first book, Canyon Riddle. Amanda and Scott’s relationship has grown and they are planning a vacation together. But before they can get out of town two things happen to change their plans: First, the U.S. Marshals call on Scott to help recapture Schmidt. Second, Scott’s grandmother shows up at his house. This is a fun story but with the twists and turns you would expect in a mystery. I enjoyed writing it and hope readers enjoy it also. I have recently retired from a job I enjoyed. I now have time to travel and write. It’s a very exciting time in my life. Yes, I’m a little nervous about this big change but not scared. Over the past years I have been planning for this day. The day I don’t work. It is now here and I am about to start traveling across the USA. No schedule to keep. No deadlines. Just the opportunity to enjoy the adventures of the day. I have been waking up and expecting my vacation to be over and it’s time to return to work. Then I remember this is my new life without steady work. Pretty exciting. In this day of public exposure to other people’s ideas and thoughts, this quote should be our constant reminder to watch our words. Social media, blogging, television, etc. gives almost everyone a chance to say their piece. Whether it is to sound off about your latest interaction with poor or great service, a wonderful meal, children’s accomplishments, crazy pet stunts, anger about a current event, or swooning over the love of your life – we all can tell or show the world. But is it wise to do this? Considering most of the comments make no difference in anyone’s life or will be remembered even a year later, do we post because we need to hear ourselves talk? I am as guilty as anyone for posting thoughts that are trifles. I try not to do this, as I want to be considered relevant. If I were to post my every thought this would cause others to view me and my comments as meaningless. No one wants to be meaningless. Does this mean I never post a silly photo or express my anger over a situation? No. I just try to think about what I want to post and decide if it has any value to anyone. Just before I click publish, I stop and ask, “Will this make someone smile, or think about a problem they may not have considered before? Or is it just babbling?” As you might expect, there are more posts in the trash than you will find here. Flag Day. June 14 – a significant day in my life. It’s the day my first son was born – I became a mother. This event has changed and shaped everything in my life since that moment. You are never really prepared to be a mother, even if you have read the best books, had an excellent role model, and babysat until you know everything about children. But then you have your own, and everything goes out the window. I’m sure someone told me that every child has a unique personality, but I didn’t listen. After all, I was the eldest of four children and had practically raised my siblings. Sheesh! I was such an idiot to think I knew how to be a mother. The learning started a few minutes before the nurse handed me my precious child to feed for the first time. The nurse took a few seconds to explain what to do and told me to relax. Like that’s going to happen! It’s my first child. A multitude of questions popped into my head at that moment as I gazed on that small bundle lying so still. What if I do something wrong, will he be scarred for life? The nurse laid the child in my arms, and immediately he began to cry. I looked up in a panic, but the nurse was totally unaware he was crying. She was helping me get ready to nurse my baby. I watched as the bundle began to twist and turn. Soon an arm and foot were out of the blanket and flapping around. The nurse smiles and encourages me to try feeding him. Feed him? He was practically turned over in my arms. Tears formed in my eyes as I tried to smile thinking, “I’m a failure as a mother!” The nurse patted my shoulder and made a couple of magical waves of her hands, and my baby was snuggled back into his blanket. So life as a mother began. Being a mother isn’t for weak people. Also, it is best to have a partner to make the job easier. Having a partner gives you someone to turn to when your perfect child becomes an absolute monster turning your dryer into a hiding place for the cat. Which by the way, cats don’t mind being put in the dryer as long as it’s not turned on. Turn the dryer on and between the bumping and howling you fear it has become demon possessed. Single moms (and dads) have their work cut out for them. If you should ever wonder why they are always tired, the answer is found when you look at their child and see he is growing, healthy, and happy. A child can drain you of energy, test your emotional well-being, and cause you to question your sanity almost every day. But when the child is sleeping on your shoulder or runs across a room as fast as their little legs can carry them to give you a jelly covered kiss, you realize this is about as good as it gets. To my first born son, happy birthday and thanks for giving me so much.